BELLA HOME has salt water POOL, NATURAL CHLORINE (NON-CHEMICAL), IS A SPLENDID and COMFORTABLE APARTMENT on the ground floor with 3 bedrooms (sleep up to 10 people ): 1 room double bed, 1 room with 2 single beds, 1 rooms with 2 single beds and 2 bunk beds (total in this room 6 people). QUIET AND CLOSE TO SPLENDID MEDITERRANEAN BEACHES AND AMAZING ARCHAEOLOGICAL SITES. FREE Access INTERNET ADSL WI-FI 24/24 h.
Outdoor terraces can be used for barbecue dinners and for sun baths by all renters. Villa Sea and Archaeology is a splendid villa close to the sea and to very famous archaeological sites: Third century Greek temple and amphitheatre of Segesta (20 minutes), antique roman town of Selinunte (40 minutes), archaeological site and gorgeus museum of Mozia and Marsala (40 minutes), splendid XI century Norman and Arab monuments of Palermo, XI century Norman Cathedral of Monreale. Live this atmosphere enjoying your staying in a new villa surrounded by pine trees, private garage, very large garden (s.m. 3000). Dear guests, my wish is that you enjoy the swimming pool and its fantastic salt water. The following rules are given by the fact that the pool that you will be using has a special high technology system (Electrolysis System) producing NATURAL CHLORE straight from salt-water and constantly controlling the degree of water PH. By this, to put the system in conditions to produce the best quality water and to give you the opportunity to get the most pleasant swim, totally exempt by any irritation on eyes, lips and nose that only the Natural Chlorine can offer you, I kindly ask you to observe the following rules. Thank you. 2. PLEASE, WEAR YOUR POOL-CAP;FOR BOYS/MEN, ONLY SWIMMING TRUNKS TO BE WORN IN THE POOL. LONG SHORTS (i.e. SURFER ) NOT PERMITTED. I take care of this villa and host tourists coming from all around the world, it's an exciting experience that renews day by day my life: new people, different languages, different habits . Dear guests, My wish is that you enjoy the villa, the swimming pool and its fantastic salt water. The pool that you will be using has a special high technology system (Electrolysis System) producing NATURAL CHLORE straight from salt-water and constantly controlling the degree of water PH. By this, to put the system in conditions to produce the best quality water and to give you the opportunity to get the most pleasant swim, totally exempt by any irritation on eyes, lips and nose that only the Natural Chlorine can offer you, I take care of it daily. The result is a pool water that you have never seen and enjoyed: perfectly clean and transparent, brilliant, soft on you skin. My biggest satisfaction is to hear by my many guests that they have never found a pool water like that and also some of them that own a pool salt water ask me to reveal them my secrets to get this fantastic water ! 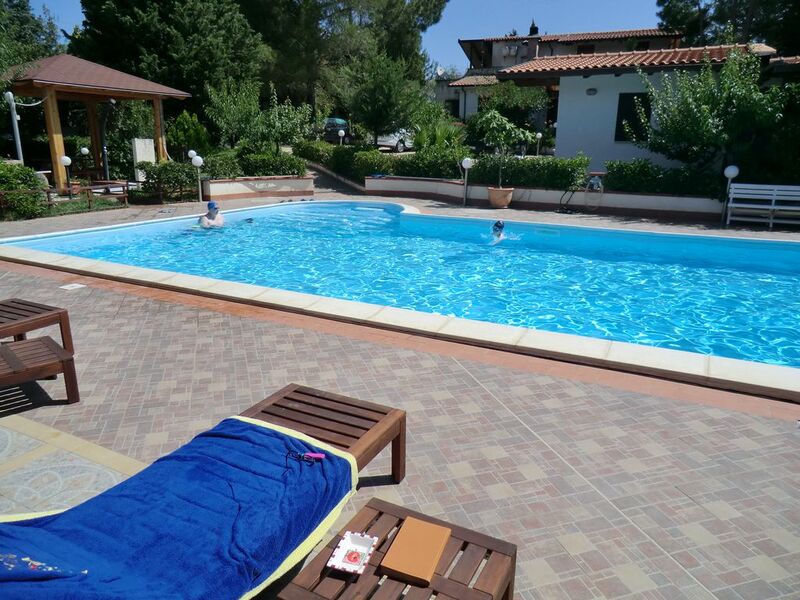 "Our villa was very clean and tidy. The gardens were well tended with plenty of flowers. The rooms are spacious and well equipped. The pool was well maintained and was a lovely place to relax during the day. Antonio was very informative and helped us with places to visit and provied us with a map pf Palermo that we could borrow." "I stayed with my friends at Bella Home and I can say that the villa is very spacious and clean. It is surrounded by beautiful plants and flowers. The rooms are nicely furnished and all facilities are in place for a self-catering holiday. Antonio was a great host, he cooked for us a lovely meal with local Sicilian produce that are fresh and tasty. He also provided us with a lot of tourist information, such as the best places to visit and see. I would recommend staying here if you have the opportunity." "We were a large group of 10 people and thought to have a holiday in sicily, we found the small village of Balestrate perfect for us. we had such a good time hear, even more fun than we expected. the villas were spectacular very welcoming and tidy, we had no trouble with anything. the owner antonio was such a pleasure to have around and was such a lovely cook, never have we had such a delicious meal it was so kind of him to cook for us. the location of the villa were perfect not too far from the town and other great villages in castella mare de golfo. we all had a great time here!!! we highly recommend these villas in balestrate!!!" Nous avons eu le grand plaisir de passer un séjour magnifique à Bella Home. Toutes les conditions étaient réunies: tranquillité, convivialité, propreté...une maison bien équipée, pratique et chaleureuse, et je ne peux oublier la belle piscine d'une propreté exemplaire entretenue avec des produits naturels.. Je salue la prestation d'Antonio, le propriétaire qui ne manque jamais de rester fidèle à ses invités en étant très serviable et à l’écoute des besoins de chacun. C'est avec plaisir que je recommande Bella Home. Location sans surprises conforme au descriptif. Propriétaire très sympathique et présent sur le site. Une piscine remarquablement entretenue. Une situation idéale pour rayonner dans le Nord Ouest de la Sicile. "pour la deuxième année, c''est toujours un plaisir de revenir a BALESTRATE, l''accueil chaleureux d''Antonio et ses proches, villa, piscine impécables. Seuls nos compatriotes Français semblent réticents aux "exigences" de propreté et de partage des lieux en bonne intelligence (ne pas faire de bombe dans la piscine etc ...), des vacances fantastiques, au centre de toutes les destinations touristiques, nous avons même visité Stromboli en laissant la voiture en parking gardé à milazzo à 2h30 par la route. A savoir Antonio parle mieux Français que nous Italien ! une troisième année s''impose ..."
I will be happy to suggest beautiful trips around and close splendid beaches !!!! Is better to come by car or rent a car there. Many beautiful beaches, nice pubs and restaurants, classic and modern music concerts and old Greek language tragedies at amphitheatre of Segesta, many amenities, all this is close and easy to reach by car. SHOWN PRICE IS REFERRED TO 10 PERSONS. ASK FOR MULTI APARTMENTS PRICE IF YOUR GROUP IS COMPOSED OF MORE THAN 10 PERSONS. Tariffe scontate in relazione alla durata, Tariffe in funzione del numero di persone, Richiesto supplemento per il riscaldamento in base alla stagione, Deposito cauzionale, Caparra richiesta alla prenotazione, Consegna delle chiavi da parte del Proprietario presente in loco.